If you're a fan of classic Nintendo, Atari and Commodore 64 games, the popular 2D game Giana Sisters may be just for you. The game is in many ways similar to the still popular Super Mario Bros, and many believe that the similarity may even be a little too big. However, this is only positive for the game, which guarantees hours of exciting entertainment if you are a fan of this type of game. In Giana Sisters, you play as the Italian girl Giana, who has ended up in a nightmare she can't get out of. Giana is going through 32 courses, collecting crystals and looking for her little sister Maria. In addition, Giana must find a giant great magic diamond that can bring her out of the nightmare and back to the real world. When the game is completed, little sister Maria awakens her older sister from the nasty nightmare. The game takes place as mentioned in 2D, just as you know it from the Mario games. Giana will run from left to right through the paths where monsters come against her. The crystals collected during a course count the player's score, which can be seen on the highscore list subsequently. In addition, the player is also given an extra life if 100 crystals are obtained. In addition to crystals, Giana can also pick up a number of bonus items that give her special powers. 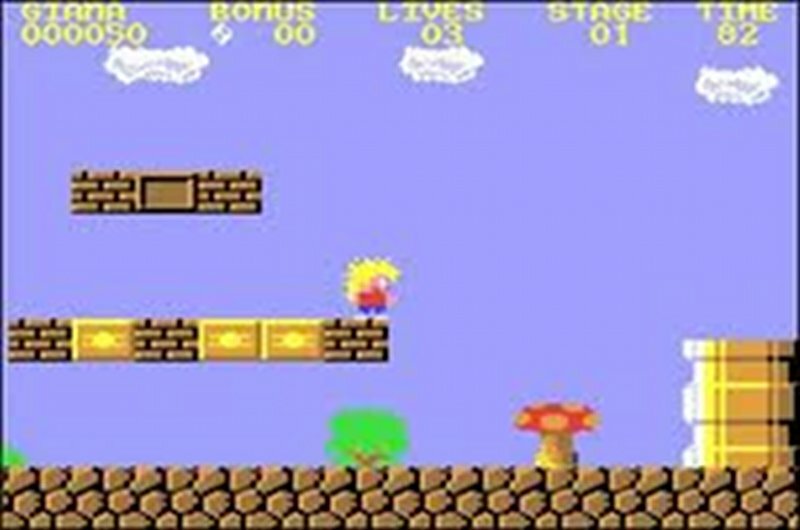 Giana, for example, picks up the fire wheel, she transforms into a boy who has the special ability to break the stone blocks by jumping up into them from below. If she finds a lightning, she is given the ability to shoot a dream bubble that damages the enemies while a water drop makes her immune to fire. In addition, they also have the very strong clock and the magical bombs that freeze all enemies on the screen, respectively, and jump all the enemies on the screen in the air. The game itself is entertaining and addictive, but playing is often more fun if you are more into it. In Giana Sisters you can fortunately also play two people together. When two people play the game together, the Friend you choose gets to play along with the act of playing as Gina's little sister Maria. Now, the two sisters are trapped in Gina's nightmare, where now two are ready to handle the monsters and collect crystals. This, of course, makes the game a bit easier than when you just play as a character, but fortunately it does not cost the entertainment value of the game. Thus, the game can also be performed twice with different experiences if you first play it alone, and then play it with a Friend. So this gives the game twice as much entertainment value as if it had just been a single-player game. 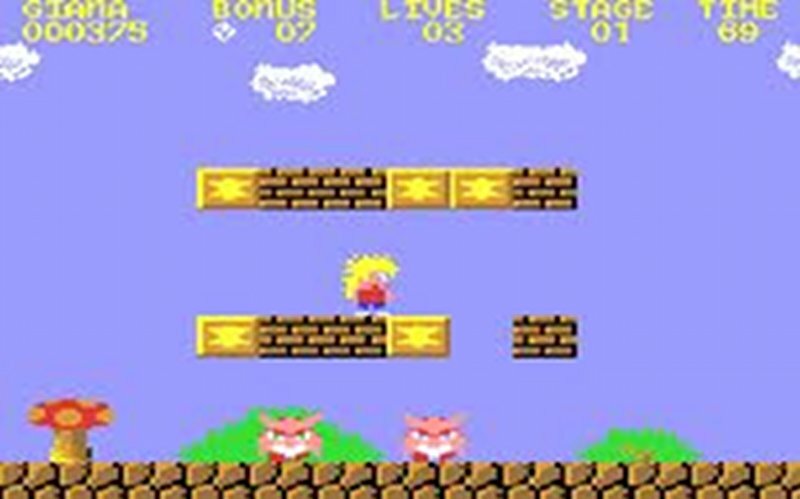 The game was released back in 1987 by Rainbow Arts, after which it received much publicity. Part of the talk included praise for the game because players around the world found it very entertaining. However, a greater part of the discussion focuses on the game's similarities with the world-renowned and very popular Super Mario Bros. So, in Super Mario Bros, it's about the little Italian plumber Mario, who has to rescue a princess from evil creatures, in Giana Sisters about the little Italian girl Giana who must save her sister Mary from evil creatures. 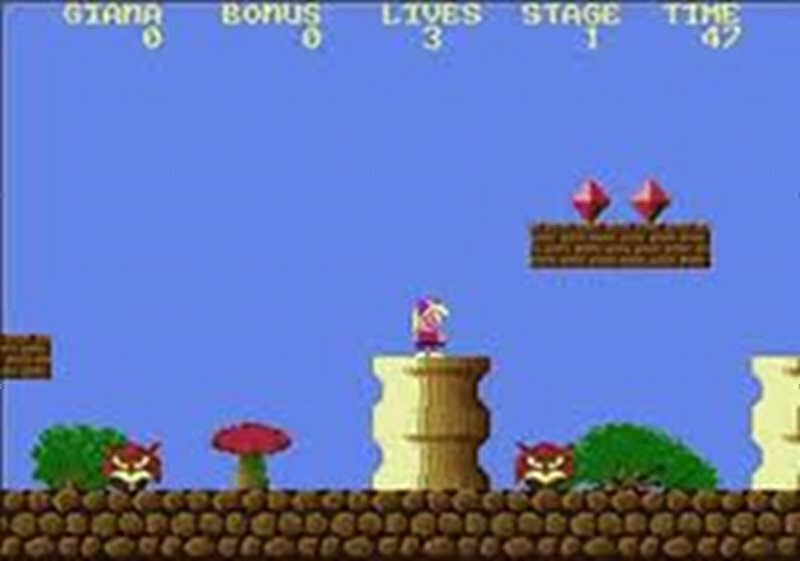 In addition, the game's visual representation and layout is very similar to what Super Mario Bros presented two years earlier. The striking similarities resulted in rumors that Nintendo, who is behind Super Mario Bros, threatened Rainbow Arts with lawsuits. However, it never came to a court case because Rainbow Arts stopped the sale of the game after the large amount of publicity. It is not known whether the rumors were kept and whether these were the basis for the sale stoppage of the game. Another little story about the game sounds like the game's main character Giana was supposed to have been called Gianna with two n's, which would also have meant a change in the game's name. When the game's cover was produced, however, the name was spelled with just a single n by mistake, which the game developers subsequently chose to adopt and use. Therefore, it is also seen in the game's rolling introtext that the main character Giana here is spelled with two n's. Since the game's sales stop, a myriad of copies of the game have been developedEasy and shared around the Internet, while other game developers have tried to benefit from the game's popularity, creating their own sequels for the game. If you are looking for more games in the style of Giana Sisters, you can also try the classic arcade game Bubble Bobble. If you are not familiar with Bubble Bobble, you may know the still popular Pac-Man, which in many ways resembles Bubble Bobble. Like Giana Sisters, Bubble Bobble can be downloaded for free. You read more about Bubble Bobble and download it by following this link. On the other hand, if you are looking for a completely different type of game, you are guaranteed absolute top entertainment if you try the award-winning The Sims 4 game. If you follow this link, you can read much more about The Sims 4, while also downloading a totally free 48 hour version of the game. You will in no way bind yourself to buy the game afterwards, and can therefore safely explore all of the game's possibilities in the 48 hours. Giana Sisters is a classic 2D game that in many ways resembles Super Mario Bros. In the game you control the girl Giana, who is trapped in a nightmare that she can't get out of. To get out, she has to complete 32 levels where she has to fight monsters and collect crystals that score points. In addition to the crystals, she must also find a huge diamond whose magical powers can bring her out of the nightmare and back to the real world. The game can be played alone, but also together two people, where the other person is allowed to play as Gina's little sister Maria. The game can no longer be purchased, but can be downloaded here for free. Several rumors say the sale of the game was stopped due to possible lawsuits by Nintendo who allegedly believed the game had copied several parts of their Super Mario Bros released two years before Giana Sisters. Find Giana Sisters 32K, mark it and choose "Uninstall"
Should Giana Sisters 32K has been damaged or corrupted and thereby difficult to remove we can recommend you finding help to uninstall it here.